Well, the final chapter in the much lauded Crysis saga is out, and it's chock full of new goodies. Sadly, I never played the first Crysis because I didn't have access to Big Blue or any of the world's other supercomputers at the time it was released. The game was PC only when the first one came out and it was notorious for requiring very powerful CPUs to run smoothly. If you didn't have a top-of-the-line machine, too bad. It was a poor choice, in my opinion, because they effectively limited the number of people whose machines could handle the game, thereby limiting overall unit purchases. Impressive graphics are one thing, but to program your way out of sales is just silly. That said, the second and third Cryses (What's the plural of Crysis?) came out on both PS3 and Xbox 360 so a much wider audience was able to enjoy this unique first person shooter. i really want a nanosuit! There are several new additions to both the nanosuit and your weapon options. It still offers the capability to operate in both stealth and armored modes, thereby deciding what type of gaming experience you will have. They also added the ability to hack certain enemies in order to get them to fight on your side, destroying both Ceph and CELL enemies. It took me a while to figure out that hacking can be performed from a distance, which led to a few untimely deaths, but once I'd mastered the technique it became clear what an invaluable tool hacking could be. As you can see from the picture above, they've added a bow and arrow to the vast array of both human and alien artillery. Unlike previous weapons, you can fire this multiple times while in stealth mode without having to allow your suit to restore its energy. In Crysis 2, one shot from most weapons meant you became visible and all enemies immediately began to blow you away. With the bow, playing the game in stealth mode was much more effective and, therefore, enjoyable. The arrows came in four different types: a plain impact arrow, an explosive-tipped arrow, an electrocuting arrow, and finally an arrow that exploded when in close proximity to enemies with the capability of taking out more than one bad guy at a time. However, they were careful to limit your ammo with the arrows just as they did with rifles, making them extremely valuable. I let go with more than one word I wouldn't want my mom to hear when I missed an enemy with one of these precious pieces of weaponry. I can't overemphasize the effect the addition of the bow had on gameplay. It really added an entirely new way to go about the game, which is rare in today's plethora of first-person shooters. As with Crysis 2, I was often confused to exactly what was going on with the plot. While the gameplay is as addictive as any game out there (I played Crysis 2 three times), the story is a bit lacking in continuity and clarity. With gameplay this addictive, it's easy to overlook some of the plot holes, but they're there and they're glaring. 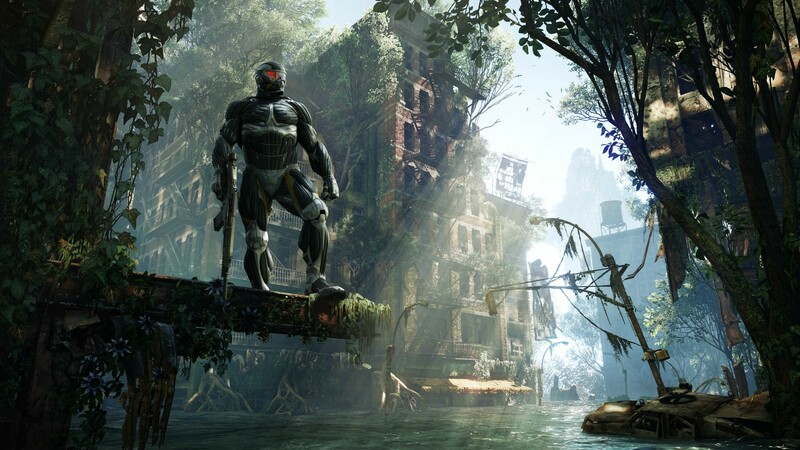 -SPOILER WARNING- While I won't divulge all the details or the ending, if you're a die hard Crysis fan and don't want to know anything about the plot before you play it, you might want to skip to the next heading. 24 years have passed since the events of Crysis 2. CELL (a government/corporate superpower) have held you hostage until now. They have learned to use alien Ceph technology to provide unlimited free power to the planet. Unfortunately, they didn't realize this would help bring about the end of all life on the planet so that it could be colonized by the Ceph. Once released from CELL custody, you join a group of resistance fighters to try to stop the impending doom from alien invaders. They reunite you with one of the former members of your unit, I'm assuming from Crysis 1, and off you go to stop the Ceph. The writers do a pretty good job of creating some emotional connection to your partner "Psycho" as well as his ex-girlfriend and leader of the resistance, Claire, a component that was sorely lacking in the previous game. As the game progresses, you learn that the fighting that took place in Crysis 2 was just the second phase in the Ceph's plan for total colonization of Earth. If the second phase is ineffective, as it was, they move on to phase 3. It consists of opening a wormhole to the Ceph home planet and bringing the "Alpha Ceph" to Earth to finish what the smaller units were unable to complete. I don't want to go into too much detail and ruin the game for you, but let's just say there's only one thing on planet Earth that can stop their plan...you! As previously stated, this game isn't tons of fun due to the story line. It's a blast because of the gameplay. Playing as a literal supersoldier of the future is an experience many games attempt to create, but none have succeeded on the level of Crysis. You have the ability to engage your nanosuit's armor and charge into a fight with all guns blazing. You also have the option of cloaking and stealthily picking off unsuspecting enemies one at a time. If you're a fan of the Tom Clancy games like Ghost Recon, you should definitely give this one a try. It takes stealth gaming and blows it up to previously unreachable heights using technological advantages that no other title can provide. This game boasts many more enemies than Crysis 2, raising the level of difficulty significantly. As you progress through the game, enemies become more numerous and deadly leading up to the final levels that require multiple attempts to clear. I believe I died more in the last two levels than the other six combined. If you missed out on Crysis 2, don't worry. The story plays second fiddle to the action, which is some of the best I've ever experienced. The graphics are second to none. The gameplay mechanics are plentiful and perfect. In short, if you're a gamer who plays for the story, you might want to skip Crysis 3. If you're just in it for the action, don't miss out on this gorgeous piece of explosive excitement. Bonuses: +1 for the spectacular array of weapons and gameplay options. Penalties: -1 for the often confusing plot. Nerd Coeffecient: 8/10 Well worth your time and attention.